Please remember to sign our Guest Book before you leave. 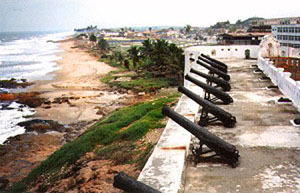 The Cape Coast Castle was built principally for commercial trading purposes, initially between the "natives" (as the local people were then called) and the European traders who came to our shores. The Portuguese were the first Europeans to come to the country. They named the place they landed "Elmina" (from the Portuguese word mina, meaning a gold mine) and the country, the "Gold Coast," because of the abundance of gold dusts they found on the land. The trade between the natives and the Portuguese settlers originally took the form of what was called "The Silent Trade", by which items from one side were bartered or exchanged for equivalent items from the other side, by tacit agreement or consent, because of language problem. The European merchandise exchanged for gold, ivory, pepper,gum, mahogany and other local items included clothing, silk, calico, blanket, sugar, spices, rum, cutlass, ax, pots, kettles and others. Gold was perhaps the most precious metal sought after in those days, for it was the means of transaction in the European market as well as those of India and the Far East. Gold was then scarce in all Europe, hence it was highly valued and priced too. So when it became known that there was a fertile and populous land beyond the seas, rich in gold and ivory called by the Moors, "The Land of the Blacks", King Henry the Navigator of Portugal made frantic efforts and got his men to reach and explore this fabulous land much fancied at that time. King Henry's dreams were realized when Portuguese traders discovered this fancied land of gold. Thus, began the lucrative trade in gold which later attracted various other European nations to the country, who subsequently built castles and forts not only to have a share in the gold deal, but actually firm footholds in the nourishing trade. The slave trade was a later addition to the commercial trade in gold, ivory and other local commodities in exchange for European merchandise. It formed part of the Triangular Trade between Europe, Africa and America. 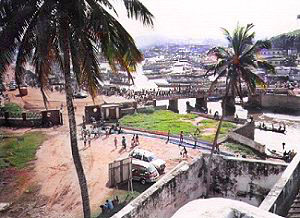 The Slave Trade is said to have began in the country round about 1480 when Europeans at Elmina sold slaves to African traders who wanted porters. Those slaves who were bartered for gold, were said to have been brought from other African Territories. Thus, it is clear that the Gold Coast then appeared to all the European powers as the most favorable country from which they could carry out their trade more profitably than in any other African territory. In the Sixteenth Century there was a flourishing trade in sugar, tobacco and rum in America and the West Indies. The English and Dutch colonies were facing labor problems and wanted more slaves to work on the sugar plantations, mines and the pearl fisheries. The prospects for the supply of slaves to those countries became bright when impetus was given to the trade. For example, in America millions of dollars were in store for any European nation which could supply sufficient number of slaves to that country to meet increasing demands. 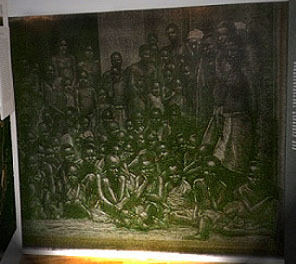 The Royal African Company established in 1672 for example undertook to supply 3,000 slaves annually to the West Indies. Hence the Portuguese who started the slave trade were followed in quick succession by the Dutch, English, French, Swedish, Danish and the Brandenburgers, who came to the Gold Coast and built castles and forts and competed seriously in the trade. They acquired lands for that purpose from the local chiefs to whom they paid monthly ground-rents and "protection money," meant to induce those chiefs and their people to be well-disposed towards them for security reasons. The struggles for footholds in the trade occasioned increasing hostilities among the Europeans. 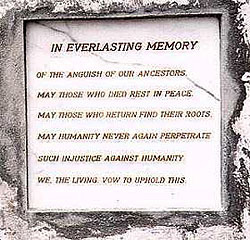 To ensure regular supplies of slaves from the Gold Coast, the European powers adopted the method of instigating conflicts and wars among the various tribes. In the ensuing confusion, able-bodied men, women and even children were captured chained or yoked together by the captors and marched to the slave market on the coast, to be sold to slave dealers. Such tribal wars which have persisted to the present day, and became the bane of Africa, thus originated from the Slave Trade. 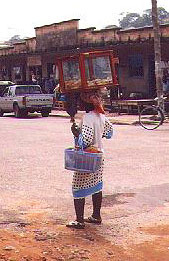 In this regard, the tribal conflicts and internecine strife ravaging Africa today are seen as the manifestations and extensions of the Slave Trade believed to be subtly ignited by the imperialist powers in the shadows, and fanned into flames by their local agents or proxies, as before, just to further what a critic describes as their "traditional historic greed." It should be noted that in recent times such conflicts are mostly in areas of rich economic resources, especially minerals, for example Angola, Mozambique etc. where civil wars have raged for nearly two decades. 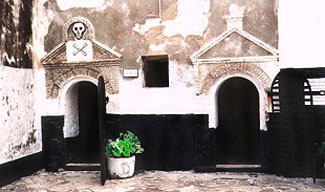 Thus, it is extremely clear that the fortunes and greatness of the USA have largely been built up, thanks to the "blood, tears and sweat" of the African Slaves in particular those from the Gold Coast (Ghana) who were transported to the New World through the "Gates of No Return" at the Cape Coast Castle. From all accounts, there is no doubt that the USA was the greatest supporter and indeed, the greatest beneficiary of the Slave Trade. It is significant that the USA and other European powers which benefited from the human and material resources and wealth of our country in the past are today among the rich industrialized nations of the world. They are still denuding Africa of her natural resources - agricultural and mineral - in various subtle ways and methods including large devaluation of African currencies and constant falling commodity prices, which ironically they, the buyers, themselves set for the producers. Besides, they have been pursuing unjust trade practices that not only deprive Africa of her just due, the fruits of the toil and sweat of her hardworking people, but actually keeping Africa perpetually in an inferior position as raw material producers, for their manufacturing industries. They garner enormous wealth thereby, but dish out pittances to Africa in the guise of economic aid and grants, while they close their markets to Africa, they dump on Africa their manufactured products - consumer goods, food items, textiles and capital goods, machinery and equipment. 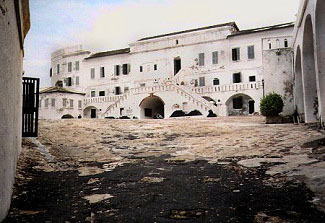 The Cape Coast Castle described as one of the six most beautiful in existence today has an interesting but checkered history. According to authentic sources it was originally built by the Swedes in 1650. In 1660, it was taken over by the British who rebuilt and enlarged it in 1662. In 1663, it was captured by the Dutch, re-captured by the English in 1664 and again improved and enlarged in 1673. In 1681, it was attacked by the people of the town, and subsequently bombarded by the French fleet in 1703 and also in 1757. It was the object of the Angle Dutch rivalry and hostilities during that period. Its rebuilding in 1757 was undertaken by the Royal African Company, one of the three principal English trading companies formed to trade in the Gold Coast among others. The other two were: The Company of Royal Adventurers of England Trading into Africa and the African Company of Merchants. 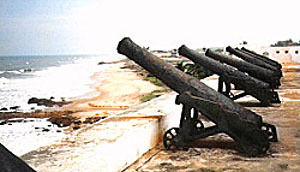 All were established under Royal Charters, to trade with Africa including in particular the Gold Coast (Ghana).